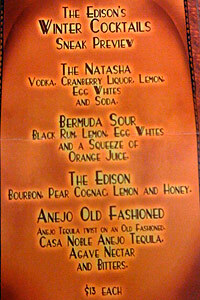 After sampling The Edison’s winter cocktails at their new menu sneak peek last night, I am hurtin’. The Añejo Old Fashioned (casa noble añejo tequila, agave nectar, and bitters) and the Edison (bourbon, pear cognac, lemon, and honey) both went down so smoothly you forget how many you’re tipping. Owner Andrew Meieran is lamenting the government furloughs a bit for affecting his Downtown biz, “We were down about 80% on that day,” he told me. But he and GM special Events Dir Barbara Jacobs have thought of inventive ways to get the right sort in. Soup Kitchen Fridays 5-7 p.m. with comp grilled cheese sandwiches and tomato soup (you even cue up like the Depression Era hand-out) and, as always, 35-cent martinis on Thursdays (their price in 1910—again 5-7 p.m. 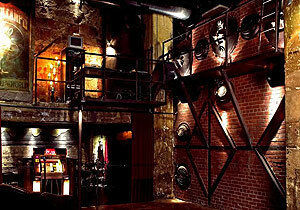 I recall being in the Generator Lounge which is filled with, well, generators and wandering over to the Ember Parlour. The whole place is a marvel in copper (an homage to the building’s original owner Copper Baron Thomas Higgins says Meieran) and every detail is attended to. Oh, and the Winter cocktail menu starts up in September. The new winter cocktails below!